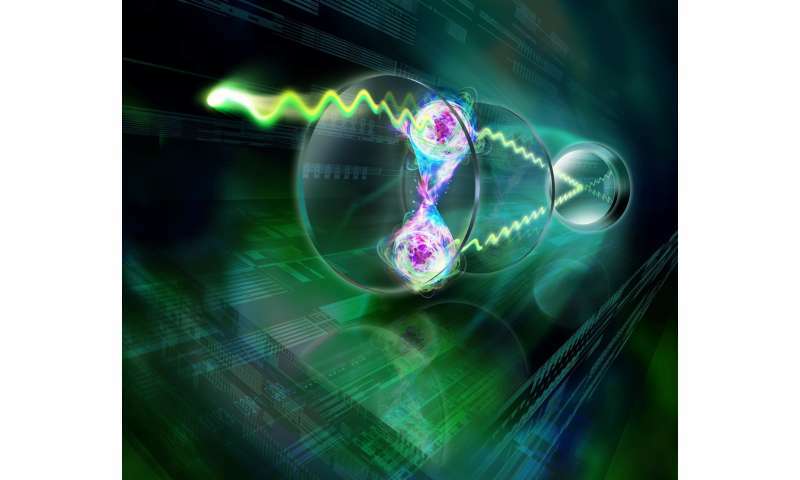 A team led by Austrian experimental physicist Rainer Blatt has succeeded in characterizing the quantum entanglement of two spatially separated atoms by observing their light emission. This fundamental demonstration could lead to the development of highly sensitive optical gradiometers for the precise measurement of the gravitational field or the Earth's magnetic field. Interesting. Here's an idea. How about separating the entangled ions by a long distance. Then "tickle" an atom on one side creating an "on/off" activity that can be "seen" and measured in the ion at the other end. Measure that "on/off" and interpret them as 0's and 1's. Instant (read: faster than light) communication between two points in space. Seems like a more fun investigation than using it as a "optical gradiometer".